U.S. stocks opened up this morning, with the S&P 500 and the narrower, price-weighted Dow Jones Industrial Average gaining 0.24% and 0.15%, respectively, at 10:05 a.m. EDT. Call it a comeback! After yesterday's market close, S&P Dow Jones Indices announced that it will add automaker General Motors to the S&P 500 and the megacap S&P 100 index after Thursday's close. GM will replace H.J. Heinz, which is being acquired by a group that includes Berkshire Hathaway. The index provider will also add another bailout stock, insurer AIG , to the S&P 100. This is a big deal, particularly for GM -- $1.3 trillion in assets are indexed on the S&P 500. Little wonder the stock is up 1.8% this morning. GM Total Return Price data by YCharts. 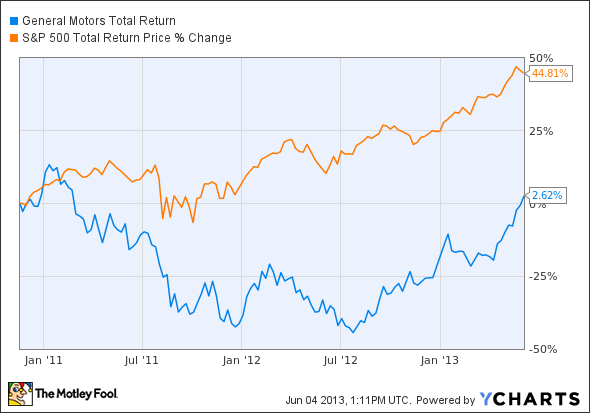 AIG Total Return Price data by YCharts. Still, reaping that return would have required nerves of tempered steel, as the shares produced stomach-churning volatility: During that period, the stock suffered a peak-to-trough loss exceeding 50% three times! That's the past; what of the future? Neither GM nor AIG is an outstanding business, but they do have a franchise. Valued at 10 times the next 12 months' estimated earnings per share versus AIG's 12.5 times, GM now looks the better-positioned stock to deliver market-beating returns. Ignoring emotions to make good investing decisions is hard, and few companies inspire such strong feelings as General Motors. The Fool's premium GM research service can help by telling you the truth about GM's growth potential in coming years. (Hint: It's even bigger than you think. But it's not a sure thing, and we'll help you understand why.) It might help give you the courage to be greedy while others are still fearful, as well as a better understanding of the real risks facing General Motors. Just click here to get started now. The article Why These 2 Bailout Stocks Are Up Today originally appeared on Fool.com. Fool contributor Alex Dumortier, CFA has no position in any stocks mentioned; you can follow him on LinkedIn. 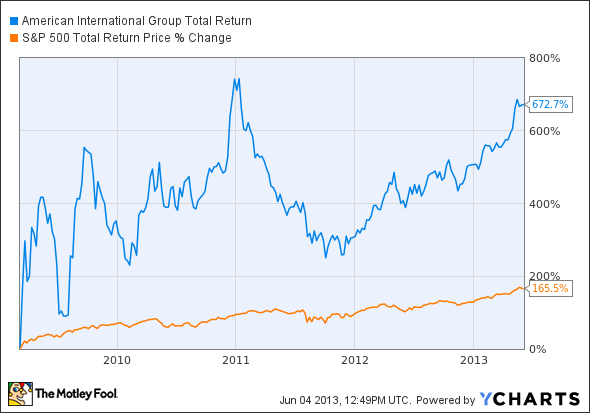 The Motley Fool recommends American International Group and General Motors. The Motley Fool owns shares of American International Group and has the following options: Long Jan 2014 $25 Calls on American International Group. Try any of our Foolish newsletter services free for 30 days. We Fools may not all hold the same opinions, but we all believe that considering a diverse range of insights makes us better investors. The Motley Fool has a disclosure policy.